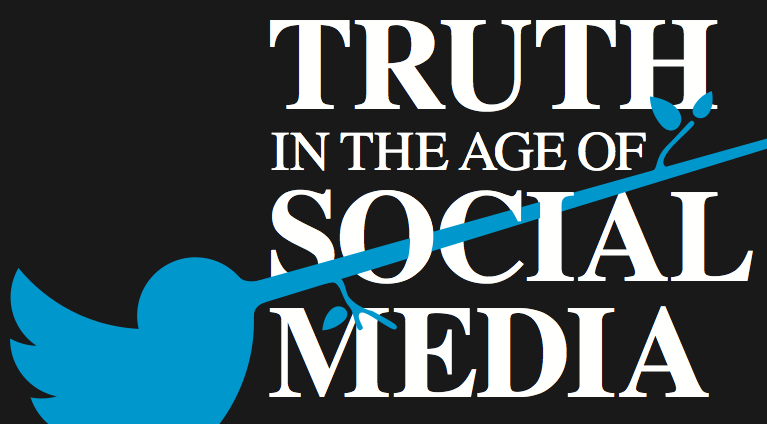 I have been writing and blogging about “information forensics” for a while now and thus relished Nieman Report’s must-read study on “Truth in the Age of Social Media.” My applied research has specifically been on the use of social media to support humanitarian crisis response (see the multiple links at the end of this blog post). More specifically, my focus has been on crowdsourcing and automating ways to quantify veracity in the social media space. One of the Research & Development projects I am spearheading at the Qatar Computing Research Institute (QCRI) specifically focuses on this hybrid approach. I plan to blog about this research in the near future but for now wanted to share some of the gems in this superb 72-page Nieman Report. I disagree. This is not an either/or challenge. Social computing can help every-one, not just journalists, develop and test hunches. Indeed, it is imperative that these tools be in the reach of the general public since a “public with the ability to spot a hoax website, verify a tweet, detect a faked photo, and evaluate sources of information is a more informed public. A public more resistant to untruths and so-called rumor bombs.” This public resistance to untruths can itself be moni-tored and modeled to quantify veracity, as this study shows. David Turner from the BBC writes that “while some call this new specialization in journalism ‘information forensics,’ one does not need to be an IT expert or have special equipment to ask and answer the fundamental questions used to judge whether a scene is staged or not.” No doubt, but as Craig rightly points out, “the complexity of verifying content from myriad sources in various mediums and in real time is one of the great new challenges for the profession.” This is fundamentally a Social Computing, Crowd Computing and Big Data problem. Rumors and falsehoods are treated as bugs or patterns of interference rather than as a feature. The key here is to operate at the aggregate level for statistical purposes and to move beyond the notion of true/false as a dichotomy and to-wards probabilities (think statistical physics). Clustering social media across different media and cross-triangulation using statistical models is one area I find particularly promising. Furthermore, the fundamental questions used to judge whether or not a scene is staged can be codified. “Old values and skills aren’t still at the core of the discipline.” Indeed, and heuristics based on decades of rich experience in the field of journalism can be coded into social computing algorithms and big data analytics platforms. This doesn’t mean that a fully automated solution should be the goal. The hunch of the expert when combined with the wisdom of the crowd and advanced social computing techniques is far more likely to be effective. As CNN’s Lila King writes, technology may not always be able to “prove if a story is reliable but offers helpful clues.” The quicker we can find those clues, the better. It is true, as Craig notes, that repressive regimes “create fake videos and images and upload them to YouTube and other websites in the hope that news organizations and the public will find them and take them for real.” It is also true that civil society actors can debunk these falsifications as often I’ve noted in my research. While the report focuses on social media, we must not forget that off-line follow up and investigation is often an option. 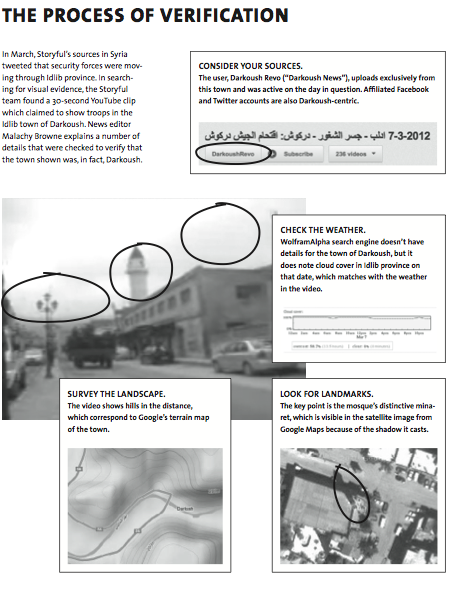 During the 2010 Egyptian Parliamentary Elections, civil society groups were able to verify 91% of crowd-sourced information in near real time thanks to hyper-local follow up and phone calls. (Incidentally, they worked with a seasoned journalist from Thomson Reuters to design their verification strategies). A similar verification strategy was employed vis-a-vis the atrocities commi-tted in Kyrgyzstan two years ago. David Turner’s piece on the BBC’s User-Generated Content (UGC) Hub is also full of gems. “The golden rule, say Hub veterans, is to get on the phone whoever has posted the material. Even the process of setting up the conversation can speak volumes about the source’s credibility: unless sources are activists living in a dictatorship who must remain anonymous.” This was one of the strategies used by Egyptians during the 2010 Parliamentary Elections. Interestingly, many of the anecdotes that David and Santiago share involve members of the “crowd” letting them know that certain information they’ve posted is in fact wrong. Technology could facilitate this process by distributing the challenge of collective debunking in a far more agile and rapid way using machine learning. This may explain why David expects the field of “information forensics” to becoming industrialized. “By that, he means that some procedures are likely to be carried out simultaneously at the click of an icon. He also expects that technological improvements will make the automated checking of photos more effective. Useful online tools for this are Google’s advanced picture search or TinEye, which look for images similar to the photo copied into the search function.” In addition, the BBC’s UGC Hub uses Google Earth to “confirm that the features of the alleged location match the photo.” But these new technologies should not and won’t be limited to verifying content in only one media but rather across media. Multi-media verification is the way to go. Journalists like David Turner often (and rightly) note that “being right is more important than being first.” But in humanitarian crises, information is the most perishable of commodities, and being last vis-a-vis information sharing can actual do harm. Indeed, bad information can have far-reaching negative con-sequences, but so can no information. This tradeoff must be weighed carefully in the context of verifying crowdsourced crisis information. Mark Little’s chapter on “Finding the Wisdom in the Crowd” describes the approach that Storyful takes to verification. “At Storyful, we thinking a com-bination of automation and human skills provides the broadest solution.” Amen. Mark and his team use the phrase “human algorithm” to describe their approach (I use the term Crowd Computing). In age when every news event creates a community, “authority has been replaced by authenticity as the currency of social journalism.” Many of Storyful’s tactics for vetting authenticity are the same we use in crisis mapping when we seek to validate crowdsourced crisis information. These combine the common sense of an investigative journalist with advanced digital literacy. This entry was posted in Big Data, Crowdsourcing, Information Forensics, Social Computing and tagged Authenticity, False, Validating, validation, verification, Verifying. Bookmark the permalink.